NOTE: The move to the BBC also sees Richardson and Richens back in complete control, with Richardson firmly in the director’s chair also. With many of the regular team developing their own careers, the ensemble cast is widened to include Gary Beadle, Sara Crowe, Doon Mackichan, Tim McInnerny, Phil Cornwell and Steve O’Donnell, and the series is now prestigious enough to attract guest stars such as Miranda Richardson, Kate Bush and even Antony Sher. A love affair over the radio requires a bank robbery, a prison break, a plane hijack, and an invasion of the Falkland Islands before “Happily Ever After”. Utterly typical of Richardson and Richens with all their faults and all their failings. On the one hand the story is original, arresting, makes sense and features strong characters and situations most of the time. There are some dreadful lapses however (the redundant and clichéd prison sequence) and the mix of drama and comedy is sometimes uneasy. With the comedy elements pushing the story toward absurdity, it is hard to take the drama as seriously as it seems to want. The series as a whole feels re-energised and refocused however. NOTE: One of Richardson’s least favourites, and he cut around 5 minutes for the DVD release, to the ire of some fans. In Hollywood’s version, GLC leader Ken Livingstone (Charles Bronson) needs all the help he can get to defeat the evil Ice Maiden (Bridget Nielson). Abbreviated re-run of “The Strike” with redundant premiere sequence to set it up but no other behind-the-scenes story. Some bright gags and a compact running time help keep the sense of gnawing familiarity at bay. Coltrane is marvelous, as ever. An paranoid American comedy movie star and a ball-busting American student cross paths at Oxford University. Odd splicing-together of ideas which never really gels. Often looks great, but the dearth of jokes is a huge problem and Henry is awful. In Italy, a crooked banker embezzles millions and then attempts to escape, pursued by two amateur hitmen in the pay of the Freemasons. Cleverly combines atmospheric black-and-white photography with cheeky gags about the lack of foreign location filming. Planer and Sayle in particular are in fine form, but the nervous hitman stuff and the Freemason jokes fall flat and feel second-hand. The near total disregard for basic cause-and-effect plotting doesn’t help either. In an England run by an eco-dictator who bans cars and television, a wedding degenerates into all-out war, although many attendees seemingly take this all in their stride, including the gatecrasher seducing the bride through a series of fantasy sequences. Disjointed and willfully nonsensical even by Comic Strip standards, this thoroughly bizarre entry does kind of work, if you’re in the mood for it. Richardson’s cool tone, as both director and de facto protagonist, anchors the piece, allows the character sketches to work in their own right, and skillfully balances the reality of the carnage with the seen-it-all-before reactions from most of the characters. Look! It’s Kate Bush. NOTE: Again, really only a Comic Strip Film if you accept the premise that everything Peter Richardson directs is a Comic Strip Film. As he directs little else (except Stella Street) and always casts from the same pool of people, it’s not an entirely untenable premise, but the film evaded the Channel 4 DVD box set in any event and I haven’t seen it either. The sixth “series” was, again, a number of one-off specials broadcast during 1992. With echoes of The Shop Around The Corner, opposition leader Glenys Kinnock has no idea that the shy Coco The Clown with whom she is striking up a passionate affair is actually Prime Minister John Major. While any number of hack newspaper cartoonists made limp fun of the fact that new Prime Minister John Major had supposedly run away from the circus to become an accountant, it took The Comic Strip to portray him as leading an insane double-life of politician by day and clown by night, and to create a genuinely tender love story into the bargain. Edmondson and French as Major and Kinnock are outstanding, and only Major’s preachily climactic speech and a slightly uneasy Sayle spoil this excellent entry which for once easily sustains its length. Also, something has happened to the budget or the film stock as this looks far glossier, more expensive and more cinematic than any of the preceding films. NOTES: Second of only two appearances in the BBC episodes by Rik Mayall, who was busy on ITV’s The New Statesman for much of this period. Transmitted on the night of the general election at which John Major was unexpectedly returned to power. This entry runs 50 minutes. No later Comic Strip film was longer. The days of hour-plus entries are thankfully behind us. Footballer Roy Brush is signed to a major London club and is quickly drawn into a whirlwind of lucrative promotions, personal appearances and tabloid coverage. However, his personal life hides a secret which may be his undoing. The satire is toothless, the themes well-worn even in 1992, and it still manages to be overlong at 35 mins. On the upside, Allen’s central performance is uncharacteristically vulnerable and all the better for it, and Antony Sher’s dementedly pop-eyed tabloid editor is a bit of a treat but overall this is a very slender entry. The juxtaposition of the supposedly moving inspirational speech from the club manager with Phil Cornwell mugging away as TV pundit “Jimmy Twizzle” behind an enormous plastic chin tells you everything you need to know about how clumsy and misguided this is. An all-American cop brings home to his wife the last Christmas turkey he can find, which turns out not to be quite dead yet, and determined not to be cooked and eaten. It takes Sue and Jim hostage and demands Bernard Matthews (the British turkey magnate) be brought to him. The only Comic Strip Christmas Special brings us more toothlessly clumsy satire, saying nothing that Douglas Adams hadn’t said in one-sixth the time, a dozen years earlier, in his dish-of-the-day sequence at the Restaurant at the End of the Universe. Many of the Comic Strip films suffer from an uneasy relationship between the narrative and the comedy. Some play the story straight and stick jokes on top, seemingly at random (Private Enterprise). Some manage to elevate the otherwise slight comedy with bravura staging and playing (A Fistful of Travellers Cheques). A precious few blend the comedy and the drama perfectly and maintain the balance throughout (Red Nose of Courage). Plenty simply don’t have enough jokes to keep the interest (The Yob). In this rare case, the glossy presentation and melodramatic acting just serves to kill what few jokes there are. And how is it that Phil Cornwell – an impressionist – can’t sustain an American accent? 3D movies – kill or cure? 3D is back in our cinemas and it’s big business. Cinemas can charge more for 3D movies, 3D movies earn more revenue and – along with monster screens – are another key differentiator for cinema, in this frighteningly modern age of Blu-ray, iTunes and Bittorrent (whatever that is). Of course, 3D is nothing new, and I don’t want to use this space to reproduce Wikipedia entries about its history, nor whine about it being used badly or inappropriately, nor even do I want to assess its place as another colour for moving picture artists to add to their palette. I want to talk about something more fundamental – what is it? The briefest of history lessons, just to explain why 3D is suddenly back in our cinemas, and to add a little context. 3D in this sense essentially means delivering two subtly different images to each eye. This can be done in various ways, with the most popular in the twentieth century being the red/blue anaglyph method. This sends a red-tinted image to one eye and a blue-tinted image to the other eye thanks to cardboard glasses. The method is cheap to implement but entails obvious compromise of colour within the images. LCD shutter glasses which blocked all light reaching each eye alternately were briefly experimented with but you can’t give out expensive items of electronic equipment free with breakfast cereal and they need both power and careful synchronisation with the projected image. Neither is ideal, which is why 3D was so niche for so long. The reason for the current swathe of 3D movie is that two new technologies have caught up with an existing one. The glasses you get given at your local Vue or Odeon today are polarised, which effectively means that half the light enters one eye and the other half enters the other eye. No colour distortion, but a dimmer image, and you can’t just blast twice the light through 35mm film to make up for the shortfall, since twice the light means twice the heat and you’ll melt the celluloid. However, the advent of digital (filmless) projectors combined with hugely reflective metal screens means that polarisation can be deployed without the images being reduced to a murky gloom. Reflective screens + polarised glasses + digital projection systems = $$$ it seems. And more is to come – 3D TV is on its way, with several lenticular (you know, like those corrugated postcards which seemed to move if you tilted them) systems which send a different image to each eye, provided you sit in just the right position and keep your head still. But what exactly is the benefit of all of this? Well, it isn’t 3D except in the very trivial sense that the images you are watching now have an apparent third dimension of depth to add to their existing dimensions of height and width. No, it’s stereoscopy or stereo imagery which is no more like actually being there than a stereo recording is actually like being at a concert. Let’s start by considering how our brains interpret the three-dimensionality of the world at the moment. Information about how near or far things are comes from three sources. Perspective. Things which are further away are smaller in our field of vision (Dougal) and parallel lines which recede from us appear to converge. Parallax. Things which are nearer to us appear to cross our field of vision more quickly, whereas things which are further away cross our field of vision more slowly. This works even with stationary objects if you move your head. Try it now and notice that your monitor or laptop screen moves through your field of vision much more than the wall behind it. Stereoscopy or stereopsis. The left eye sees a different version of the image than the right eye. The brain automatically combines both images into a single version of reality, giving each element of the image a “depth value”. Of these three, perspective is present in any photograph of the world, and is obviously a part of any movie, 3D or not. The second, parallax, in the first sense is equally present in any live-action movie and, was a key reason for Walt Disney to create his multiplane camera in the 1930s. However, in the second sense, it is absent from all movies, 3D or not. You can’t move your head and see a different image as you could if you were witnessing the events live. The 3D stereoscopy is an illusion, one which is shattered if you try and interact with the image in even the most trivial way. We are not Luke Skywalker, able to walk around the projection of Princess Leia and see her from whatever angle we please. At least with your “RealD” glasses you can move your head without the image actually falling apart, unlike those lenticular TVs I mentioned earlier (disclaimer: this technology will obviously improve over time and I haven’t sat in front of one myself yet, so I know not whereof I speak – but that’s the prerogative of a blogger, is it not?). Undoubtedly, 3D stereoscopy can enhance some movies. It can also ruin others (for some insights into what’s going right and wrong see this fascinating series of article by David Bayon on the PCPro blog). But it would please me if there were more realistic descriptions readily available for what is going on. Traditional “2D” cinema creates an illusion of depth through perspective and parallax. People with good vision in only one eye don’t live in flatland and if you close one eye, your ability to – for example – catch a ball will only be very slightly impaired. Stereoscopic movies enhance the depth illusion but do not complete it, and very odd effects can be created when an object which appears to be jutting out towards the viewer, then moves off the edge of the screen. Stereoscopic movies are probably here to stay and the technology now exists to retrofit stereo into movies shot with a single camera, so we’ll be seeing more of them, not less. But they aren’t now, nor will they ever be as three dimensional as the room you’re sitting in right now. For that, you’ll have to go to theatre. NOTE: “Series 3” is in fact three specials shown over a three year period, which also saw the production of two feature films. The new title sequence with a drawing of a village rather than a map makes its debut. In a world where TV detectives solve real cases, Bonehead and Foyle reunite to solve a kidnapping armed only with tight Y-fronts and a sack of 10ps for the phone. Bracingly original mix of drama school satire and TV spoof, with plenty of laugh-out-loud moments, but suffering from too many winks at camera (especially the ending). The names “Bonehead” and “Foyle” are dreary, sub-Mad Magazine placeholders and are typical of the occasional laziness which mars this entry. NOTE: No “Comic Strip Presents” title sequence as Allen wanted to distance the film from the others in the sequence, but has all the hallmarks of one and led to a sequel (“Detectives on the Edge of a Nervous Breakdown”) which is unarguably a “Comic Strip” film. It is included on the C4 DVD box set. Desperate to impress his girlfriend, Dennis boasts to his girlfriend that he is involved in a major drugs-smuggling operation. Before long, he has agreed to turn Queen’s evidence and finds himself in a hotel room with a beautiful police officer and her ex-boyfriend. The story sustains itself admirably and the characters are well-drawn, but only Alexei Sayle’s motorcycle cop is really funny enough. Coltrane’s walk along the pier is staggering though and there are other pleasures along the way, such as the uniformly strong performances, with Saunders and Richardson in particular happily inside their comfort zones (which they aren’t always). Parody of “Rebecca” with Edmondson as the upper-class twit who prefers dogs to his new wife and French as the creepily ever-present Maid. French’s preternatural ability to inhabit every aspect of Saunders’ life works beautifully, but it is often too close to the source to be really funny – an error which would be endlessly repeated in French and Saunders’ TV shows. A delivery man on parole steals a demo tape from a recording studio and makes the band a huge success without them knowing. After the hilarious highs of “Eddie Monsoon” and “Bad News”, Edmondson’s next stint as writer (and for the first time, director) is a bit flat with no real sense of jeopardy, especially in the last five minutes. Not available on DVD, so I’m relying on my memory of watching it when it first came out, which is of a horrible muddle involving an androgynous waiter, Nosher Powell as the Home Secretary and a Solyent Green ending which was traded-on extensively in the publicity material and yet I fear is meant to be a shocking surprise. NOTE: No “Comic Strip Presents” title sequence and its status is less clear, especially as it was not included in the DVD box set. NOTE: Richardson and Richens take a back seat but the one film they contribute is the jewel in the crown. As other would-be writers step up to the plate, and as the budget balloons, a regrettable tendency to self-indulgence begins to engulf the series. None of the Series 4 films come in at under an hour and most struggle to sustain their length. An earnest script-writer is horrified to see what Hollywood does to his screenplay depicting the miners’ strike. The Comic Strip’s finest hour (and a quarter), the cross-cutting from finished movie to behind the scenes sustains brilliantly (far better than GLC), the cast all play multiple roles to perfection (Sayle again is stunning) and it’s genuinely funny all the way through. A triumph and well deserving of its acclaim and Montreux win. The worst heavy metal band in the world reunites at the behest of a documentary crew. Limp rehash of Bad News redeemed by the insane Donnington sequence. A pair of repellent male escorts, in a crazed pursuit of money to buy alcohol, intercept an instruction addressed to their neighbour to “take out Nicholas Parsons”. Not realising that this implies a hit, they take the place of a pair of competition winners who have won a night out with the family entertainer. Lunatic precursor to “Bottom” which features all of their usual touchstones: light entertainment figureheads, lethal dipsomania and extraordinary violence. Stephen Frears keeps the pace up, Cook is hilarious – as is Parsons as himself – and the gags keep coming. If you have ever liked Mayall and Edmondson, you’ll adore Mr Jolly, but it won’t make any new converts. During an experiment, a yob switches brains with a pretentious pop video director. Slick and glossy and boasting some good performances, but the one joke doesn’t sustain and it moves at a snail’s pace. It seems to be a pure expression of Allen’s hatred for both ends of the social spectrum and is consequently thoroughly off-putting as well as being very self indulgent and largely witless. One of a pair of identical twins is released from prison, to find his gangland brother and mother waiting for him. More self-indulgence, with Sayle constructing a pretty ropey framework for his own stand-up routines, and playing two roles himself – both fairly poorly. After his superb performance in “Strike”, this is a huge disappointment. Only Graham Crowden’s barking mad judge emerges unscathed. A loser’s misadventures on an 18-30 holiday for which he is too old. The southbound slide of the series continues with this utterly uninteresting entry, which again I couldn’t make it to the end of. Irretrievably boring after 10 minutes, I gave up after 30, fed-up of watching thinly-drawn characters annoy each other in unpleasant surroundings. What the hell is the Comic Strip doing aping “Duty Free”? Dire. I have a history of being a very picky eater. As a child, I subsisted for years on a diet of frozen French bread pizzas, sweetcorn, Birds Eye potato waffles and edam cheese. It’s a miracle I didn’t keel over from malnutrition. In adult life, I’ve attempted to conquer most of my, what food writer Jeffrey Steingarten acutely identifies as, food phobias. The big areas of difficulty remain fish, especially shellfish; milk and cream, especially in a sweet context; and eggs. I have learned to tolerate hard-boiled eggs in something like a Cobb salad, for example, and a few years ago made the exciting discovery that fried eggs in particular are quite nice with bacon. (Really, it sounds peculiar, but you should really try it). Scrambled eggs remain utterly beyond the pale, combining as they do an unpleasantly eggy flavour with a revoltingly sloppy and slobbery texture. I have a similar aversion to porridge – and don’t get me started on custard. My wife tells me that (with a little help from St Delia) I make the best scrambled eggs in the world. I can’t say for certain – I’ve never sampled them. On the thing which has in the past frustrated me as the chief cook in our household is my inability to stomach omelettes. 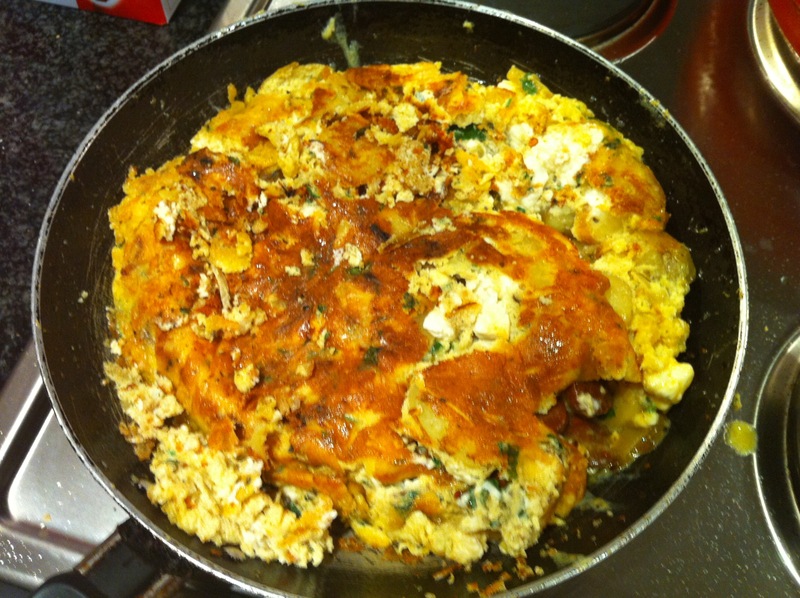 Omelettes combine fast convenience with their ability to incorporate whatever you happen to have in the fridge. Like risotto, once you have mastered the basic recipe, you can fling in almost whatever you fancy. Unlike risotto, an omelette is ready in 5-10 minutes and requires very little in the way of constant stirring. Inspired by a satisfactorily overcooked and delectably rubbery omelette I ate on a plane (really!) I recently tried a gutsy Gordon Ramsay version which involved frying up bacon and tomatoes, then pouring the eggs into the same pan and adding cheese (I think parmesan) and other good things. But after half a portion, I had to surrender as the relentlessly slobbery egginess overpowered me. 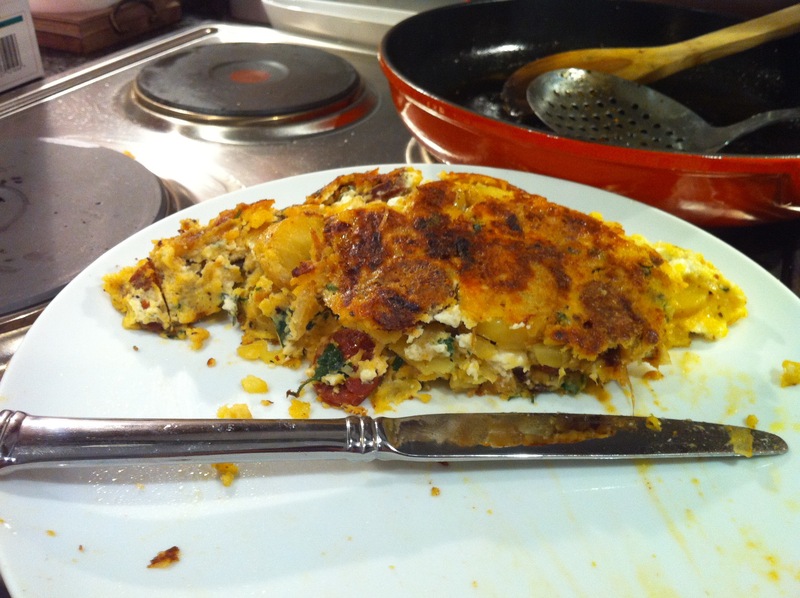 The fearsomely forensic Felicity Cloake tackled the Spanish omelette in her “perfect” Guardian column this week, and her article made me think that this might be the way forward. A dinner primarily consisting of potatoes, with some bright salty flavours to cut through the relatively small amount of egg, which would a) serve merely as a cement to glue the thing together, and b) be heavily caramalised and for the most part cooked through to rubbery toothsomeness. Luckily for you, I documented the process. I’m adding chorizo and feta to Felicity’s basic recipe, as well as taking some short cuts. This is still around 40 minutes to an hour from fridge-opening to plating up – considerably less than a French omelette – but it’s fairly relaxed, leisurely cooking for the most part. Take your time and have fun. Onions and potatoes: I cut up a Spanish (of course) onion and gently fried it in olive oil until it was mostly transparent. While the onion cooked, I sliced up around 300g of charlotte potatoes as thin as I reasonably could (I didn’t bother to peel them, although Felicity says I should have). They went into the pan for another 10-15 minutes until they were basically cooked through, but before the onion went from brown to burnt. Feta cheese and herbs. I’ve got a 200g pack here, cut into cubes, a generous pile of chopped flatleaf parsley and just a little fresh thyme. Combine: once the chorizo is cooked, everything goes in with eggs to ensure an even distribution of ingredients. Stuck and falling apart. What you hope, if you take the turn-out-on-to-a-plate method, is that a beautifully golden-brown omelette will plop neatly out of the pan ready to be slid back in, runny-side down for a further gentle cooking. What actually happened in my case, due to the age of my pan, or lack of care, or who knows what, is that bits of the omelette stuck to the bottom of pan and had to be hacked free with a slotted spoon. This significantly impaired the aesthetic of the dish, but the taste didn’t appear to suffer. Serve. When the other side is finally done, turn the whole thing out and cut slices to serve. The quantities given serve four as a modest main course. The results were almost exactly as I had hoped. 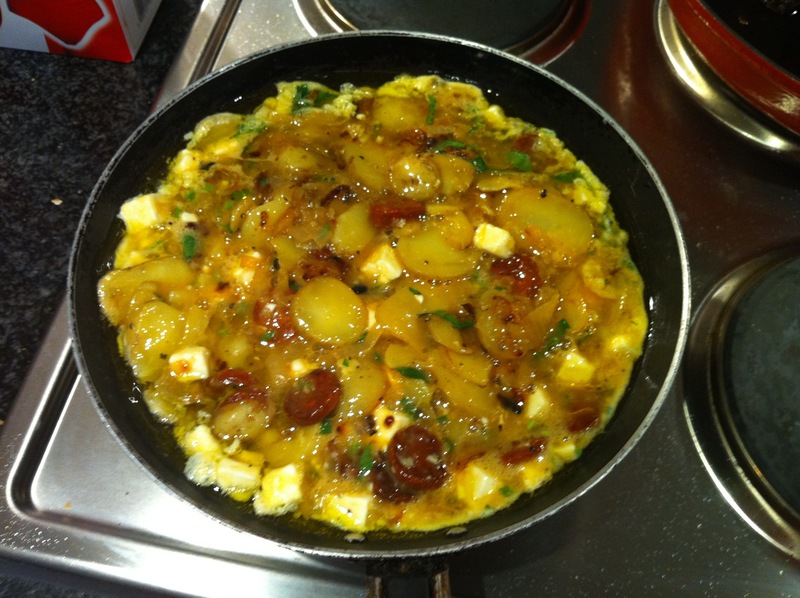 The omelette was very satisfyingly potatoey and the sharpness of the feta and the salty richness of the chorizo combined with the iron parsley to cut through what little eggy cement there was in a very lively way. The result was comforting, filling, fresh and none too difficult to prepare. It was also delicious cold the next day. The only questions which remain are – what else is good to put in a Spanish omelette (red pepper, broccoli, parmesan, taleggio, gruyere, bacon – any other ideas) and is there any really difference between Spanish omelette and the Italian frittata except geographically? UPDATED TO ADD: Tonight’s version included bacon, purple sprouting broccoli and pecorino cheese and was quite delectable. I also learned the trick of turning it out of the pan neatly.